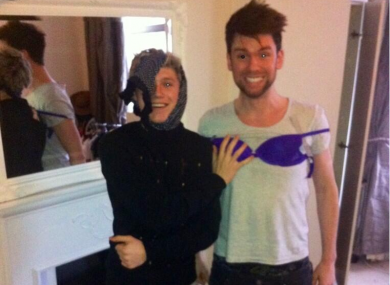 The Dredge: Did Niall Horan do a piddle in Laura Whitmore's sink? #LAURA WET-MORE Did One Direction scamp Niall Horan do a wee in presenter Laura Whitmore’s sink? Well, that’s what The Voice presenter Eoghan McDermott is claiming*. #MULLINGAR MASSIVE Meanwhile Horan has given Irish fans of his fellow Mullingar musician Niall Breslin a nudge to buy his new album. People of Ireland! My bro @nbrez is just shy of #1 in the album charts this week! C’mon lets get Bressie t number 1! Buuuuyyy it! Bressie faced some tabloid troubles earlier this week when his stance on legalising cannabis was criticised. #BABY LOVE Is one of Kate Middleton‘s friends going to choose the name of the new royal baby? The sproglet is due in mid-july and she said that she and Prince William have a shortlist of names, but obviously they’re giving nothing away. Psst Kate… how about Emer? Michael? Louise? Conor? All winners! Email “The Dredge: Did Niall Horan do a piddle in Laura Whitmore's sink? ”. Feedback on “The Dredge: Did Niall Horan do a piddle in Laura Whitmore's sink? ”.